James Philip (Jim) McKiernan, the third of eight children of James and Mary (Maisie) McKiernan, was born on 11 October 1944 in Cavan, Ireland. From the age of six he attended De La Salle College run by the Christian Brothers but left at the age of twelve, blaming brutal and humiliating treatment that he had received at the hands of one of the brothers. He spent a further two years at Crubany National School, located four miles from Cavan, before ending his formal education at age fourteen. McKiernan's father, an unskilled labourer, sustained a serious head injury in a fight in 1950 and suffered from debilitating epilepsy for the remainder of his life. The condition meant he was unable to support his large family and led to his hospitalisation for an extended period in 1955. Of necessity, McKiernan took work in a series of jobs immediately after leaving school, working as a petrol pump attendant, an abattoir worker and a messenger. Recalling the 'desperate plight' of his family during this period, McKiernan noted that 'an inferior social service system ensured that our family subsisted on charity from organisations such as the St Vincent De Paul Society and handouts from friends and relatives'. At sixteen years of age McKiernan followed the path taken by his elder brother and sister, migrating to England. After spending time in London and Birmingham he undertook a four-year apprenticeship in Stafford. In 1969, having gained a trade qualification as a first-class machinist, he migrated to Perth, Australia, taking advantage of an assisted passage scheme. He was accompanied by his wife, Jean, whom he had married in 1966, and their son. On arrival in Australia McKiernan only found intermittent work but, within six months, he took on a position as a machinist/fitter and turner at Dillingham Shipyards in Fremantle, where he remained for the next four years. Although McKiernan had never taken an active interest in union matters, he had joined a union in England so as to fit in. Upon arriving in Australia he joined what he believed to be an equivalent union, the Australian Society of Engineers (ASE). He later left the ASE, after the union had failed to speak up for a worker who had been sacked for participating in union activities, and joined the Amalgamated Engineering Union (AEU) which later became the Amalgamated Metal Workers' Union (AMWU). This move inspired him to become more active in the union movement which he later described as 'the only real organisation outside the political sphere which can or is willing to do anything for the working class'. Over time McKiernan held a number of positions in the union culminating in his appointment in 1976 as the AMWU's first full-time education officer in Western Australia, a position he retained until he entered Parliament in 1984. Prior to joining the ALP in the late 1970s McKiernan was a member of and had campaigned for the Communist Party of Australia (CPA). He noted that many influential figures in the union movement had been members of the CPA, including Albert John (Jack) Marks, who played the role of mentor and confidant to McKiernan during his early union career. He also recalled that although his decision to join the CPA was born more of rebelliousness than ideology; it was his connection to the CPA that went on to inspire his interest in Australian politics. Yet he decided to leave the CPA and join the ALP as the CPA had 'from time to time been a distraction in the union education program' and he began to question the party's relevance to his life. McKiernan held a series of positions within the ALP during the late 1970s and early 1980s, including: state conference delegate; member of the state executive; member of the state administrative committee; delegate to the national conference; and president of the Perth electorate council. By his own account, his commitment to union and political work during this period had a negative effect on his home life and contributed to his 1982 separation from his first wife, Jean, who took custody of their three children. After considering the advice of friends and colleagues McKiernan sought preselection for the House of Representatives electorate of Perth before quickly withdrawing. Instead, he put his name forward for preselection to run for a Western Australian Senate seat in the 1983 double dissolution election. He secured the sixth position on the ALP ticket but was not elected, even though all ten Senate seats were vacant. In the subsequent 1984 half-Senate election, McKiernan was preselected in third position on the party ticket and on that occasion was successful, commencing his term on the next sitting day of the Senate following the election, 21 February 1985, due to the requirements of the Representation Act 1983, under which the number of senators to represent each state was increased from ten to twelve. 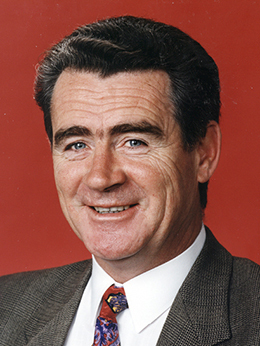 McKiernan was re-elected at the 1987 double dissolution election, the 1990 half-Senate election and the 1996 half-Senate election, the latter two from the top of the ALP ticket. After his divorce, in January 1985 McKiernan married Jacqueline (Jackie) Watkins, a sitting member of the Western Australian Legislative Assembly who held the seat of Joondalup (1983–89) and, later, the seat of Wanneroo (1989–93). After leaving state politics Watkins worked in McKiernan's office until the conclusion of his Senate career in 2002. In his first speech to the Senate on 25 March 1985, McKiernan explained that the 'suffering of my childhood has coloured my attitude to life'. He went on to state that he had learned through bitter experience how 'unjust and inequitable our Western style societies can be. The rich and wealthy command, control and walk all over the weak and disadvantaged'. He devoted the remainder of this speech to addressing the state of the manufacturing industry in Australia but commented that a great many other issues had vied for his attention, including Aboriginal land rights, nuclear weapons, uranium mining, taxation and health care. McKiernan served on a wide variety of parliamentary committees during his time in the Senate, but it was his engagement with the issue of migration which, over time, came to dominate his attention. Being a migrant himself he empathised with migrants and he advocated expanding Australia's migration policy to attract people of 'good standing' to Australia. He pursued this cause through the Joint Select Committee on Migration Regulations and its successors, the Joint Standing Committee on Migration Regulations and the Joint Standing Committee on Migration, which he chaired from 1993 to 1996. He was also a member of both the legal and constitutional references and legislation committees, which also dealt with migration issues, chairing the references committee from 1996 to 2002. I have participated in this area by choice. I could have turned my back on it ... I could have accepted the lie that all persons in immigration detention are refugees or even asylum seekers, but to do so would have been to let the constituents of my adopted country down, and I am pleased that I did not. Between 1993 and 1994 McKiernan chaired a high-profile inquiry of the Joint Standing Committee on Migration into the length of time that asylum seekers had been spending in detention before their applications were processed. The committee ultimately recommended that the policy of mandatory detention should not be changed, but that greater consideration should be afforded to releasing detainees after six months. McKiernan continued to support mandatory detention right up until the end of his career, even while in Opposition. He saw the Howard Government's hard line on unauthorised arrivals as a good deterrent, especially at a time when the number of unauthorised boat arrivals to Australia had increased significantly. In October 1999, in accordance with Labor policy, he openly defended the Howard Government when it looked to introduce temporary protection visas for unauthorised arrivals and, in 2001, he voted in favour of a raft of government bills that had been introduced in the wake of the MV Tampa incident of August the same year. Yet, he was still careful to emphasise his discomfort with certain aspects of the 2001 legislation, including removal of judicial review from the Migration Act 1958, stating his determination to amend these elements of the Act if the ALP were put into government at the 2001 election. This never came to fruition; Labor's election loss, amidst significant internal tension over migration policies, effectively embedded the measures in the Act. Beyond migration, McKiernan made contributions to Senate debates on a number of matters of particular relevance to Western Australia, including reform of the state electoral system, the mining industry, and corruption affecting the City of Wanneroo Council. His Irish heritage, the Northern Ireland peace process and Australian-Irish relations were prominent themes of his speeches. McKiernan also chaired the Joint Select Committee on Certain Aspects of the Operation and Interpretation of the Family Law Act (1991–92). The committee undertook a sweeping inquiry into the Family Law Act 1975, one of the first since the legislation was introduced. The resulting report argued that the Family Court needed to further develop and expand its mediation, conciliation and counselling processes, to assist applicants to resolve cases before they reach the litigation stage and to reduce costs. The report also included a recommendation aimed at amending the existing legislation to better empower the Family Court to enforce its orders and injunctions. The work of the committee, together with the work of the Joint Select Committee on Certain Family Law Issues, influenced the drafting of the Family Law Reform Act 1995, legislation which, as described by McKiernan, had 'been a very long time in coming'. McKiernan was among a group of parliamentarians whose citizenship status came under scrutiny, following several High Court decisions regarding dual citizenship and the disqualification of senators or members under paragraph 44(i) of the Constitution. McKiernan had retained his Irish citizenship through both the 1984 and 1987 elections, and accepted that he may have been subject to disqualification had a challenge been mounted at that time. On the advice of the then Attorney-General, Lionel Bowen, McKiernan reluctantly renounced his Irish citizenship prior to the 1990 election. An avowed republican, McKiernan pursued a campaign, via lobbying and the presentation of twenty-eight petitions to the Senate between 1992 and 1993, to remove references to the Queen from the oath or affirmation of allegiance to be made by new Australian citizens. The passage of the Australian Citizenship Amendment Bill 1993 brought this campaign to a successful conclusion. As parliamentary convener of the ALP's Left faction (1987–91), McKiernan publicly commented on matters of controversy within the ALP, such as uranium mining policy, privatisation of government assets and Australia's participation in the Gulf War. He was also Deputy Government Whip in the Senate (1987–91) and the returning officer for the Federal Parliamentary Labor Party (1990–96). The latter position saw him preside over and announce the results of both leadership ballots held between Bob Hawke and Paul Keating, in June and December 1991. During these contests McKiernan was a vocal Hawke supporter and a critic of Keating, effectively precluding him from a ministerial post under a Keating-led Government. McKiernan used his valedictory speech to reflect on his personal experience of migration. He stated that his generation of Irish were 'born for the road' and that, in his case, fortune had smiled upon him, in both England and Australia. He described his committee work as arduous and at times traumatic as a result of the subject matter, but he also found it rewarding. His fellow senators lauded his contribution to and expertise in the field of migration and noted the assistance his staff had provided when negotiating difficult migration processes. They also noted that he had brought a great sense of humour to the chamber and had been one of its outstanding characters, with his unorthodox taste in ties drawing considerable comment. Despite suffering periods of ill health, McKiernan remained active in public life after leaving the Senate. He sat on the WA Disability Services Commission Board (2005–11), served as a sessional member of the WA State Administrative Tribunal (2005–10) and served on the WA Carers' Advisory Council (2007–09). Continuing to pursue his strong interest in migration, McKiernan was also appointed as a member of the Migration Agents' Advisory Board, serving from 2009 until 2015. This entry draws on material contained in handwritten notes provided by Jim McKiernan; Transcript of interview with the Jim McKiernan by P. Donovan, 16–17 August 2012, POHP (access restricted); CPD, 25 March 1985, pp. 735–40, 25 Nov. 1998, pp. 674–6; 'Senator Jim McKiernan—Profile', Committee Bulletin, Sept. 1997, p. 5. POHP; CPD, 25 March 1985, pp. 735–40, 25 Nov. 1998, pp. 674–6, 27 June 2002, pp. 2906–10; 'Profile: Senator Jim McKiernan', House Magazine, 12 Oct. 1988, p. 3; 'Senator Jim McKiernan—Profile', Committee Bulletin, Sept. 1997, p. 5. POHP; CPD, 25 March 1985, pp. 735–40, 27 June 2002, pp. 2906–10; 'Women in Parliament: Fact Sheet 8', Parliamentary Library Western Australia, May 2013, p. 6. 'Immigration detention in Australia', Parliamentary Library Background Note, 20 March 2013, pp. 5–8; Committee of Privileges, 40th Report, Canberra, Dec. 1992; CPD, 7 Dec. 1992, pp. 4297–301, 17 Dec. 1992, pp. 5422–5, 2 March 1994, pp. 1217–23, 8 March 1995, pp. 1588–9, 27 June 2002, pp. 2906–10; Jim McKiernan, 'Mandatory detention: a view to assist the discussion', paper tabled 15 May 2002; Jim McKiernan, 'Asylum, border control and detention', People and Place, Vol. 3, No. 2, 1995, pp. 39–42; Jim McKiernan, 'Boat people: the saga continues ... ', paper tabled 24 Aug. 1995; Jim McKiernan, Transcript of address to Punishment Without Crime Seminars, Sydney, 23 June 1993, p. 7; Australian (Syd. ), 10 July 1993, p. 8; Media release, Senator Jim McKiernan, 30 July 1993; CT, 31 July 1993, p. 1; WA (Perth), 14 May 1994, p. 46. Joint Standing Committee on Migration, Asylum, Border Control and Detention, Canberra, Feb. 1994; Committee of Privileges, Possible Improper Disclosure of Document or Proceedings of Migration Committee (48th Report), June 1994, p. 8; CT, 26 Nov. 1993, p. 11; 'Immigration detention in Australia', Parliamentary Library Background Note, 20 March 2013, p. 8; CPD, 24 Nov. 1999, pp. 10610–14; 24 Sept. 2001, pp. 27697–700. CPD, 5 Dec. 1985, pp. 3010–11, 12 June 1986, pp. 3860–3, 16 May 1985, pp. 2062–3, 31 Aug. 1995, pp. 851–2, 21 Aug. 1996, pp. 2791–4, 26 Oct. 1995, pp. 2684–5, 28 Nov. 1995, pp. 4082–3, 1 Dec. 1995, pp. 4599–603, 25 Nov. 1996, pp. 5952–3, 1 Oct. 1997, pp. 7409–10, 21 Nov. 1996, pp. 5874–5, 17 March 1988, pp. 921–2, 25 May 1998, pp. 3040–1, 24 Oct. 1989, pp. 2087–90, 24 Oct. 1995, pp. 2391–4, 23 Aug. 1999, pp. 7550–3, 29 Sept. 1993, pp. 1416–19; Joint Select Committee on Certain Aspects of the Operation and Interpretation of the Family Law Act, Report, Canberra, Nov. 1992; SMH, 8 March 1990, pp. 1, 10; Age (Melb. ), 26 Nov. 1992, p. 15; POHP; Herald Sun (Melb. ), 3 May 1992, p. 11. CT, 23 Jan. 1991, p. 1, 25 Aug. 1990, p. 1; SMH, 24 Jan. 1991, p. 4; Australian (Syd. ), 13 Dec. 1991, pp. 1, 2; Age (Melb. ), 13 Dec. 1991, p. 5; SMH, 13 Dec. 1991, p. 9; CPD, 27 June 2002, pp. 2906–10, 2868–9, 2870–1, 2885–93; POHP. This biography was first published in The Biographical Dictionary of the Australian Senate, Vol. 4, 1983-2002, Department of the Senate, Canberra, 2017, pp. 527-531.